Although it may be a bit “much” for some, I do enjoy incorporating slightly more put together elements when dressing down. To polish up a casual look, I like to throw feminine textures, cuts, a heeled shoe, and of course a bright and pretty lip colour. How do you like to wear casual? I prefer to ‘dress-up’ casual wear too. I usually lean towards black skinny bottoms and then play around with different tops and jackets and pops of color with nail polish and make-up. Lipstick and heels – always. I hate dressing casually, haha. I love layers, the one thing I actually enjoy about winter. This look is a yes for me! I love how your peplum and cropped jacket look together! And I love you booties. So cute – I love that jacket! I usually for jeans & a fun lip color now! such a lovely look Jen!! Sometimes it is so hard for me to do casual because I am not a huge fan of jeans (not that your wearing jeans in this post but you know what I mean). Even in my casual outfits I do like wearing heels or wedges. I love your peplum top by the way! Peplum is so elegant. that top is stunning! Love this! I love all your winter coats!! I live in LA so it doesn’t get as cold, but you make me want to stock up on coats!! I like to wear casual with straight cut jeans for the most part and paired with flats be it boots or ballet flats. I enjoy the more put-together casual look; it’s actually the way I prefer to do a casual outfit too. 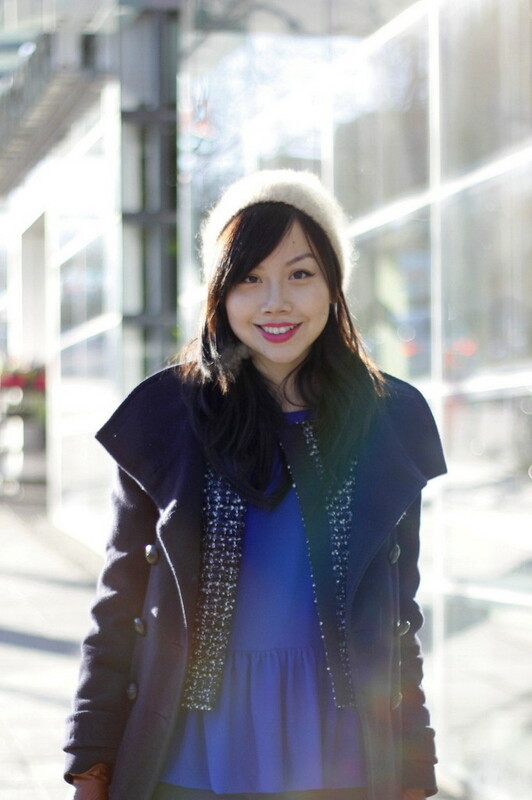 I love the way you incorporated different tones of navy and blue, and the hat is a nice, cozy touch. 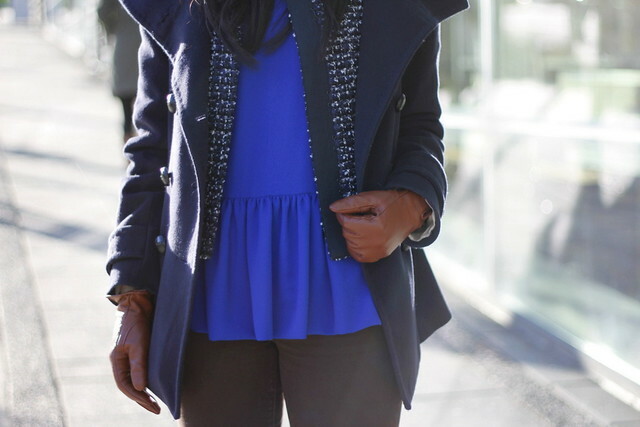 Love the cobalt peplum top – the colour looks amazing on you!